Our panel of ESPN NFL experts wraps up the free-agent frenzy and answers questions on the biggest topics around the league.Come back each day this week for a new question. : Ha Ha Clinton-Dix to the Bearsfor one year, $3.5 million. The safety fills a need in Chicago next toEddie Jackson after Adrian Amos signed with the Packers. And GM Ryan Pace gets it done at a reasonable rate. Clinton-Dix can find the ball, and he has the instincts to make plays in the passing game. While I would like to see the former Pro Bowler take cleaner angles to the ball and finish with more consistency at the point of attack versus the run, the traits are there to fit in Chicago's system behind one of the NFL's top front sevens. : Jason Verrettto the 49ers for one year, $3.6 million. The Niners are headed the right direction, but getting the defense in order is an absolute must. The second perimeter corner opposite Richard Sherman has been a big problem area, so throwing a low-risk, high-reward dart at Verrett makes a ton of sense. The 2014 first-round pick enjoyed a breakout 2015 season in which he was one of the league's best in coverage, but injuries have limited him to just five games the past three seasons. : Eric Weddle to the Rams for two years, up to $12.5 million. There was a lot of chatter about the Rams being in the Earl Thomas sweepstakes, which would have required a major spend and might have kept them from signing Dante Fowler Jr. and affected other aspects of their offseason. Weddle coming available and wanting to stay close to his San Diego home was a gift for the Rams, who filled their need at safety much more cheaply with a player who will help them in many ways. : Eric Weddle to the Rams for two years, up to $12.5 million. This looks like a solid value, given how much other safeties got paid last week. Sure, Weddle is 34 years old and wasn't as productive last season as he has been in the past, but he still anchored one of the league's best defenses and fills a hole on the Rams' roster. Los Angeles can move on after one year without taking too much of a hit. : Tevin Coleman to the 49ers for two years, up to $10 million. Coleman's 2019 salary is only $3.6 million. The rest of his package is great for the team as well, and 49ers coach Kyle Shanahan knows how to use backs who catch the ball as well as Coleman. : Ha Ha Clinton-Dix to the Bearsfor one year, $3.5 million. The safety market got pricey this offseason, making this deal a bargain by comparison. Clinton-Dix is 26 years old and has not missed a regular-season game in five NFL seasons. Chicago looks like a good landing spot. : Tevin Coleman to the 49ers for two years, up to $10 million. Teams are well-advised to avoid spending on veteran running backs, but in reality, the deal is quite friendly to the 49ers. They will pay Coleman $3.6 million in 2019, and his 2020 salary would not be guaranteed until next year. Compare that to the $12 million the 49ers paid free-agent tailback Jerick McKinnon in 2018. Plus, Coleman has relatively low mileage (528 rushes in four seasons) and is an excellent receiver. : Jason McCourty back to the Patriots for two years, $10 million. The defensive back played every snap for the Patriots in Super Bowl LIII and was one of the team's steadiest players all of 2018. Retaining him for two years and $10 million is a terrific value for the champs, as McCourty not only brings quality play on the field but also is an excellent teammate and valuable member of the locker room. Reid:All the Giants' moves. I know, I know. I'm not working precisely within my editor's parameters. But indulge me for a moment. The Giants have made so many head-scratchers, they deserve their own category. The Giants announced that they're sticking with future Hall of Famer Eli Manning for another season, which means their inevitable rebuild won't begin in earnest for at least another year. Then after they recommitted to Manning, the Giants traded OBJ. They also let safety Landon Collins, a rock both on the field and in the locker room, walk. 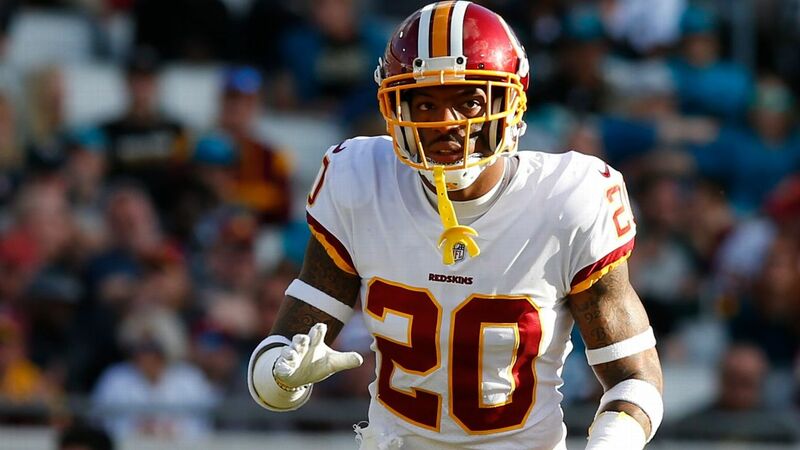 He joined Washington, the Giants' NFC East division rivals. And what's up with giving Tate a four-year deal when that aforementioned rebuild is coming? For many Giants fans, general manager Dave Gettleman is fast approaching Ray Handley territory. : C.J. Mosley is a good player, but why are the Jets paying $17 million a year for an inside linebacker? As an NFL team exec explained recently, the Jets and other bad teams do not get to pick which players will be available in free agency, so the market disproportionately dictates how they are going to build their teams. They will enter the 2019 season with a combined $30 million in salary dedicated to the inside linebacker and running back they signed in free agency. : The Giants' trading Odell Beckham Jr. Let's not overthink this. Beckham is a 26-year-old, generational talent who has had one of the most productive starts to his career (92 receiving yards per game) in NFL history. He was locked into a contract that could have kept him off the market through his prime and would have helped elevate any Giants quarterback he played with. If you're worried about maturity issues, then you're going to miss out on some of the most dynamic playmakers in the game. : I'll use the Golden Tate move as a symbol for the confusion surrounding the Giants' direction. Tate is awesome and worth the contract he earned, but all signs pointed toward the Giants rebuilding this offseason, prior to their handing out a four-year deal to the soon-to-be-31-year-old wideout. Sando:Michael Bennettto New England. I liked the Patriots acquiring Bennett for their defensive line while knowing they would get a 2020 third-round compensatory choice for losing Trey Flowers. Bennett is 33 and could decline at any time, but the Patriots are getting short-term and long-term insurance without handing Flowers the $18 million-a-year deal Detroit gave him. Seifert:Antonio Brown to Oakland. Brown paved the way for more star movement. Picking up where pass-rusher Khalil Mack left off last summer, Brown broke free from what he considered an untenable situation in Pittsburgh. You can argue whether Brown was right about that, if he went about it the right away and whether Oakland will be any better for him. No one wants to see the NFL emulate the NBA's player-driven team-building structure, but the NFL is more interesting when stars can push through a system that otherwise lets teams sit on them. Bowen:New York Jets. The Jets are my pick after they added offensive pieces around second-year quarterbackSam Darnold with running backLe'Veon Bell, wide receiverJamison Crowder and guardKelechi Osemele. Plus, New York landed a defensive leader in linebacker C.J. Mosley. And the Jets still hold the No. 3 overall pick, which could put them in a position to draft an impact defensive lineman or edge rusher for defensive coordinator Gregg Williams' unit. Clay:Green Bay Packers. The Packers were already underrated entering free agency, and they did a nice job filling some obvious voids. Preston Smith and Za'Darius Smith reinvigorate the pass rush, Adrian Amos is an impact player at safety, and Billy Turner offers an upgrade at guard. With a terrific quarterback, offensive line and defensive front, as well as some intriguing youth in the secondary, Green Bay is primed to jump back into the NFC North race. Graziano:Oakland Raiders. 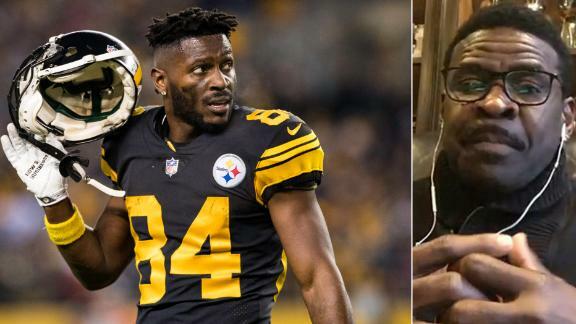 If Odell Beckham Jr. wasn't the best player to change teams, Antonio Brown would have been. Tyrell Williams is a nice complement to him at receiver. SafetyLamarcus Joyner fits a need on defense, which is the side of the ball I expect them to focus on early in the draft. And Trent Brown should be a helpful left tackle. The Raiders might be gearing up for Las Vegas, but the final year in Oakland has a chance to be a lot better than the past two were. Kimes:Oakland Raiders. I'll go with the Raiders, who added one of the best wide receivers in the league (Antonio Brown) and the most talented receiver available in free agency (Tyrell Williams). I'm worried that new left tackle Trent Brown won't be able to match his success in New England, and there's a ton of work to be done on that defense, but the Raiders undeniably got significantly better last week. Sando:Oakland Raiders. I'll take the Raiders over the Browns regardless, because there was more room for improvement (Oakland was 4-12 last season, compared with 7-8-1 for Cleveland). Antonio Brown, Tyrell Williams,Trent Brown and Lamarcus Joyner will give Oakland a solid boost. Seifert:Philadelphia Eagles. Let's not forget what the Eagles have done, amid outsized concerns that they would be too tight against the salary cap to do much. They signed defensive tackle Malik Jackson to play alongside Fletcher Cox, as potent an interior pairing as there is in the NFL. And they brought back receiver DeSean Jackson, who is still one of the NFL's top deep threats and is adept at the routes quarterback Carson Wentz throws best. Yates:Buffalo Bills. I love the approach the Bills have taken this offseason with a blend of significant investments (centerMitch Morse for four years, for example) and one-year fliers to patch up roster holes and evaluate whether a player fits in long term (offensive linemanLaAdrian Waddle, for example). General manager Brandon Beane and coach Sean McDermott have preached patience and process, and we're seeing the team make major strides. 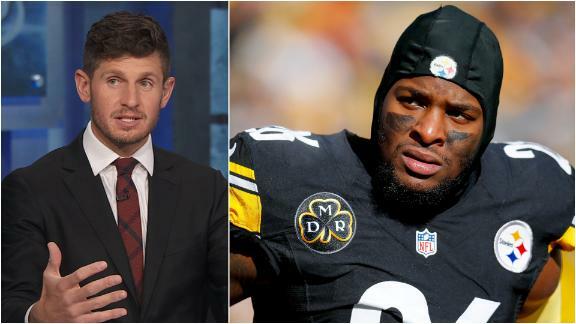 Josina Anderson and Dan Orlovsky discuss some of the best bargain free agent deals so far this offseason, while former coach Jack Del Rio argues the best bargains have yet to come. 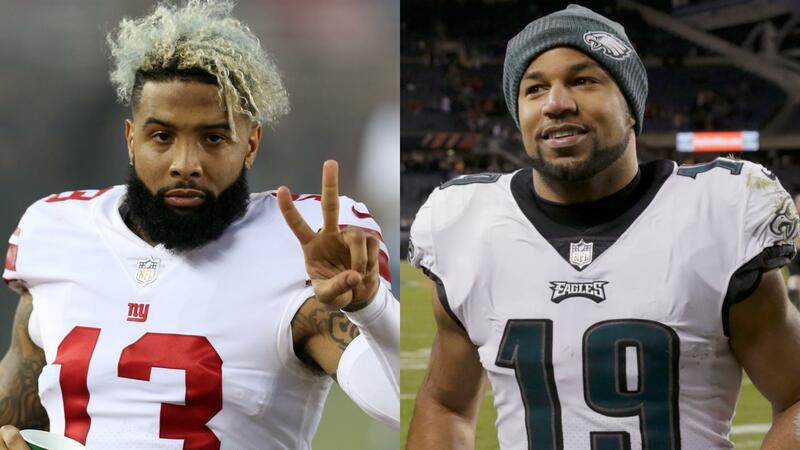 Golden Tate and the Giants agree to a four-year, $37.5 million deal to fill the void left by Odell Beckham Jr.'s move to Cleveland. 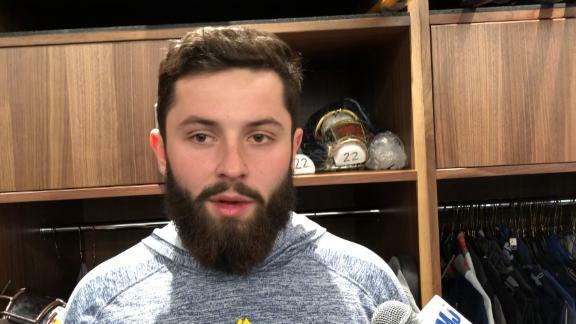 Baker Mayfield reacts to Odell Beckham Jr. joining the Browns and comments on how he expects them to get along well. 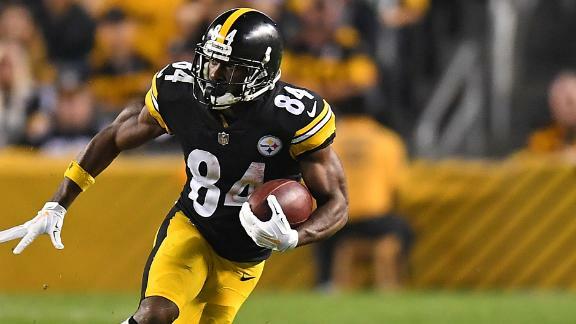 Michael Irvin explains what impact Antonio Brown will have with the Raiders and how Jon Gruden is the right person to coach him.